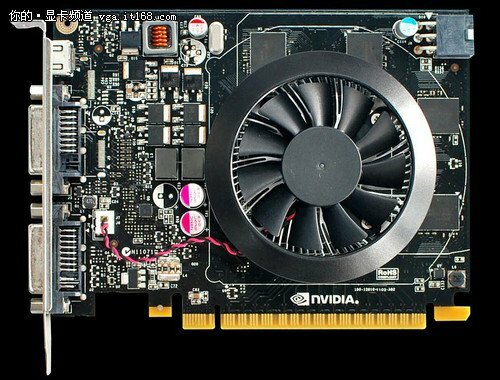 TPU came across the first pictured and the alleged specifications of NVIDIA's GeForce GTX 650 graphics card. Based on the same GK107 chip as the GeForce GT 640, this new card offers faster GDDR5 memory but has a reference design that closely resembles the GT 640. Its reference design board closely resembles that of the GT 640, with the exception of the black PCB and a 6-pin PCIe power connector to draw power from. Interestingly, the new chip has the same typical power draw rating as the GT 640, at 65W. This could give it a significant performance/Watt edge over its predecessor, the GeForce GTS 450. The GeForce GTX 650 packs 384 CUDA cores, 16 ROPs, and a 128-bit wide GDDR5 memory interface, holding 1 GB of memory. It is said to feature similar GPU clock speed to the GT 640, lack of GPU Boost, but with 5.00 GHz GDDR5 memory, compared to the 1800 MHz GDDR3 memory the GT 640 features.